There is something about warmer weather that always makes me want to add a touch of eclectic ethnic flair to my wardrobe. 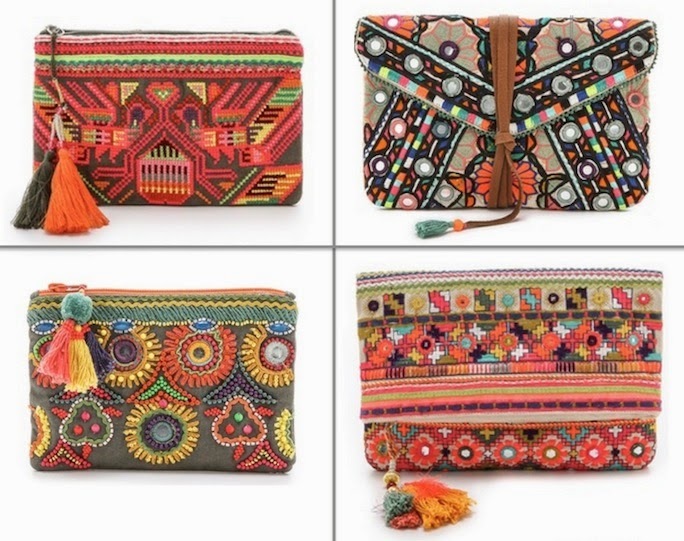 The bohemian bag and accessory line, Star Mela, has the perfect amount of global influence to help you feel as though you've traveled to an exotic location and came back with a prize all your own. From fluorescent threading, mirrored beads, and pom accents, their current clutches and purses are on my must list at the moment. I'm also adoring Star Mela's embroidered pouch bag and large embellished tote. Star Mela is available on Shopbop, which lucky for us is having a 25% off sale when you use the code INTHEFAMILY14 now through midnight of April 17! Pretty bags, I love the second most.